Inside Organics are manufacturers of heathy nutrition products and we are launching a new brand in Europe called Rawlicious. At Rawlicious, we believe healthy nutrition should be tasty, enjoyable and fun. We are passionate about food; from sourcing the finest ingredients to creating mouth-watering, delicious recipes that will optimise your daily nutrition without sacrificing taste. Inside Organics hand pick a selection of some of the finest and purest natural and organic beauty products, including skincare, bath products, make up, haircare, organic baby care, selection of vitamins and supplements as well as super and raw foods. Whether you're looking for a healthy snack or a quality protein to enhance your nutrition, RawLicious has the answer. We have four products: kale chips, crackers, snackaroons and protein. Notwithstanding any but brilliant, all of our snacks have their particular nutritional values. For example, full of fresh ingredients, our crackers will optimise your daily nutrition without sacrificing quality or taste. Same with our raw snackaroons, which are lovingly handcrafted in the UK from only the best quality organic ingredients. Our Ultimate Raw Protein is a premium quality, totally natural, 100% plant-based whole protein which contains a complete amino acid profile necessary for your dietary needs. Our kale chips are not only delicious, they are jam packed full of goodness, low in calories & carbs & high in vitamins A, C & K, calcium & folic acid. 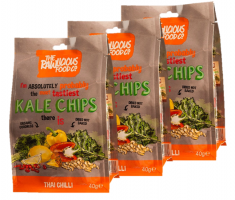 Our raw & organic Kale Chips have been voted "Best New Food Product" at the Natural & Organic Europe Awards 2013. The first of their kind to be certified organic by the Soil Association, our Kale Chips are so tasty, you'll forget they're good for you! So why eat raw? Science now proves that cooking not only destroys nutrition & enzymes but chemically changes foods from the substances needed for health into acid-forming toxins, free-radicals and poisons that destroy our health! Healthy nutrition needn't be boring or dull, & our quality raw ingredients ensure the flavours remain intact. And where possible, the raw ingredients are soaked and sprouted before mixing, making sure that every bite is bursting with nutrients and flavour. Only the best will do, so we use only the freshest of ingredients, sourced from the finest organic growers. Our products are approved organic by the Soil Association, the ingredients are sourced from non-GMO suppliers and our packaging is recyclable. All of our products are free from wheat, gluten, dairy, added sugars or any form of additive. "Inside Organics hand pick a selection of some of the finest and purest natural and organic beauty products, including skincare, bath products, make up, haircare, organic baby care, selection of vitamins and supplements as well as super and raw foods."